Projected insurance prices in Oregon for 2019 are $1,288 every 12 months for full coverage. Comprehensive insurance, collision, and liability insurance cost an estimated $286, $524, and $334, respectively. Gresham and Portland have the most expensive car insurance rates, and the three largest writers in Oregon are State Farm, Farmers Insurance, and Progressive. For a middle-aged driver, Oregon insurance rates go from the cheapest price of $396 for just liability coverage to a much higher rate of $2,782 for a high risk driver. These price differences show why anyone shopping for car insurance should compare prices for a targeted area and their own driving history, rather than relying on generic averages. Use the form below to get accurate rates for your location. Enter your Oregon zip code below to view companies that have cheap auto insurance rates. Companies will appear below. Or click to load full page. Chart shows Oregon car insurance rates for different coverage choices and risks. The lowest rate with discounts is $738. Drivers who choose higher $1,000 deductibles will pay $1,104. 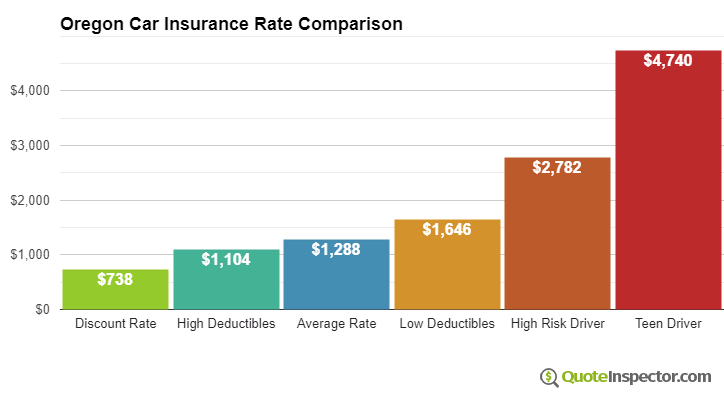 The average rate for a driver around age 40 using $500 deductibles is $1,288. Using more expensive $100 deductibles for comprehensive and collision insurance could cost up to $1,646. High risk drivers could be charged around $2,782. The price for full coverage for a teenage driver can be as high as $4,740. Insurance prices in Oregon also range considerably based on liability limits and deductibles, your driver profile, and your choice of vehicle. The city you live in has a huge impact on auto insurance rates. Less congested rural areas could have rates as low as $1,000 a year, while some neighborhoods in Gresham and Portland could have rates closer to $1,800. Even different neighborhoods close to each other in the same city can have large rate differences. These price discrepancies illustrate why it is so important to get rates for your specific zip code. Your auto insurance company has an impact on price. Every insurance company has their own rate formula, and prices can be substantially lower or higher depending on individual risk factors. In Oregon, car insurance prices range from $701 with Grange to as high as $3,161 with Sentry. Companies like Oregon Mutual, Country, and Travelers fall somewhere in between. These are probably not the prices you would pay, as where you live in Oregon, your vehicle make and model, and your driving history have to be considered. The type of car, truck, or SUV you buy is a primary factor in determining the price you pay for auto insurance coverage in Oregon. Driving a cheaper and safe vehicle will have a lower insurance cost thanks to lower repair costs and less likelihood of injuries in accidents. The following table shows insurance cost estimates for the most popular vehicles that are insured in Oregon. Annual estimated premium for full coverage, $500 deductibles, driver age 40 with clean driving record. Because rates have so much variability, the only way to know who has the cheapest car insurance rates is to compare rates from as many companies as possible. Each insurance company uses a different rate calculation, and rates will be varied. How Much is Auto Insurance in Oregon? How Much Does Insurance Cost for a Ford F-150 in Oregon? Who Has the Cheapest Car Insurance for Teenagers in Oregon? How Much are Insurance Quotes for a Toyota RAV4 in Oregon? How Much are Insurance Quotes for a Toyota Camry in Oregon?